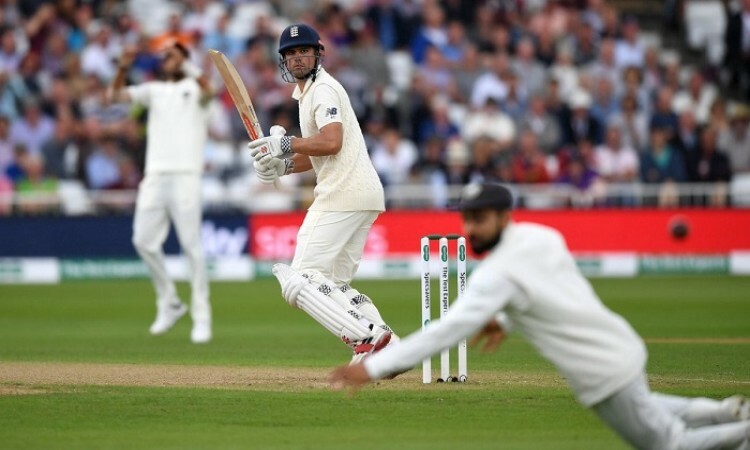 Nottingham, Aug 19 (CRICKETNMORE): England were 46/0, trailing by 283 runs at lunch on the second day of the third Test match against India here on Sunday.Openers Alastair Cook (21) and Keaton Jennings (20) were at the crease when umpires called for the break. Cook faced 30 balls and slammed three boundaries while Jennings played 25 deliveries and hit the same number of boundaries. Earlier, resuming the day at 307 for six, India's lower-order batsmen -- Ravichandran Ashwin (14) Ishant Sharma (1 not out), Mohammed Shami(3) and Jasprit Bumrah (0) -- failed to make any substantial contribution to the score. Overnight batsmen Rishabh Pant (24) managed to add just two runs to his score before going back to the pavilion.